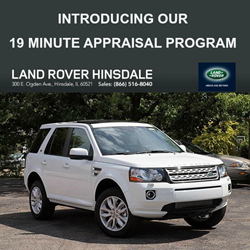 Land Rover Hinsdale is excited to introduce their new complimentary 19 minute appraisal program, now offered exclusively at the Land Rover Hinsdale dealership. Land Rover Hinsdale is excited to introduce their new complimentary 19 Minute Appraisal Program, now offered exclusively at the Land Rover Hinsdale dealership. The Program is open to the public, and welcomes all luxury vehicle owners to stop by Land Rover Hinsdale located at 300 East Ogden Avenue in Hinsdale for a courtesy appraisal in just 19 minutes. The Program is not limited to just Land Rovers but is also open to all luxury vehicles and SUVs. Land Rover Hinsdale is looking to add all kinds of luxury vehicles and SUVs to their inventory this Spring. The popularity of the 2014 Land Rover model line means that Land Rover Hinsdale is prepared to offer the top value for pre-owned Land Rovers, luxury vehicles and SUVs to boost their current inventory. An Appraisal Manager is always available on site to answer any questions about the appraisal process. This is a service that is not typically seen at auto dealers, and is another way that Land Rover Hinsdale aims to provide value and variety to their customers. “We are excited to offer this complimentary Program to our customers, and to anyone who stops into the dealership. Our motto is, ‘19 minutes to spare, and Land Rover Hinsdale will be there.’ This Program provides a great opportunity for those looking to upgrade to a new vehicle or sell their current vehicle locally with ease and no pressure. Land Rover Hinsdale is prepared to offer top dollar for pre-owned luxury vehicles and SUVs, as well as pre-owned Land Rover vehicles,” said John LaRock, Land Rover Hinsdale Center Manager. Pre-owned luxury vehicle values usually peak in the springtime, which means customers can anticipate the most money for their pre-owned Land Rover, luxury vehicle or SUV now. Once they have an appraisal in hand, customers have the option to sell their vehicle outright or to trade-in to Land Rover Hinsdale, but there is no obligation to do so. The appraisal information is a courtesy to help give customers an idea of their vehicle’s value, plan for their future automotive needs. The 19 Minute Appraisal Program is available until May 31st, 2014. Hours of operation are Monday – Thursday 7:00am – 8:00pm, Friday 7:00am-6:00pm, Saturday 7:00am-5:30pm, and closed on Sundays. Contact Land Rover Hinsdale for further details.